Most existing research and online content is geared towards understanding Western, specifically American, millennials. Millennials in the Middle East are mostly ignored, both as consumers and as employees. This is not only a shame for the millennials themselves, who resent the lack of attention, but also for companies operating throughout the region. Not only are Arab millennials the majority of the region's consumer base, but they are also, increasingly, taking on leadership positions. Employers in the Middle East need to attract, retain and engage with local millennials in order to be successful in the region. As for marketers, the focus is no longer the region’s wealthiest people, but its booming middle class of 150 million people, most of whom were born in the 80s and 90s. A recent report by HSBC Private Bank suggests that the Middle East is home to the highest proportion of millennial entrepreneurs in the world - 63% of the business owners they screened in the Middle East were aged 35 or under. That's followed by China and Hong Kong, where just under half of all entrepreneurs in each country were millennials. Based on more than 2,800 active business owners, worth between $250,000 and $20 million, the research also suggests that the region has the youngest average age for entrepreneurs: 26 years old. In the Middle East, 46% of these entrepreneurs started their businesses at school or university, the highest proportion of any country or region in the world. The report highlights that local millennials measure entrepreneurial success by the size of their business, more so than personal wealth, which is considered more important as a marker in the US, the UK, Germany and France. While globally millennials (employees included) place more weight on their personal power and influence, in the Middle East, more than half of the millennial population prioritizes high earnings. Millennial entrepreneurs in the Middle East also seem to work the hardest. Their average workday is 12.5 hours, more than 2.5 hours above the global average for millennials. They’re the Middle East’s greatest asset and their entrepreneurial spirit seems to be shaping the future of the region. According to Sobhi Tabbara , HSBC’s Global Market Head of Private Banking in the Middle East: “Middle Eastern entrepreneurs are incredibly driven in meeting their goals, with a hungry young generation working significantly longer hours, compared to the rest of the world, to achieve this”. According to Cisco , 69% of consumer internet traffic in 2017 in the region will be to video. In fact, the world’s most avid YouTube viewers are in Saudi Arabia. The rise of video consumption and content creation via YouTube, has made online video the marketing weapon for targeting millennials in the region. YouTube has more than a billion users, almost a third of all people who use the internet. Every day those people watch hundreds of millions of hours of videos on YouTube, which in turn generates billions of views. According to a Google report , watch time on YouTube is growing by 60% year-on-year in the MENA region, which ranks second after the US and ahead of Brazil in terms of watch time. Millennials all over the Middle East are turning to YouTube to consume content that hits closer to home. Taboo topics are addressed and content mostly avoids government censorship, unlike traditional media. In a country like Saudi Arabia, where you have to cross the border to Bahrain to go to the movies, YouTube is clearly offering entertainment, as well as political and social engagement, where local networks don’t, can’t or won't. Young creatives also emerge as part of a media revolution that has changed the way millennials seek entertainment. In particular, more women are using YouTube to express their views and creative talent. For example, Hatoon Kadi , has become the face of female comedy in the Kingdom of Saudi Arabia, with a loyal follower base on YouTube. She recently spoke to CNN about creating engaging online content: "I just seized the opportunity because female perspective is lacking." Across the Middle East and North Africa, content relevant to women has seen a 50% year-on-year growth, challenging negative perceptions of the region. Saudi Arabia leads the region with the most female-led channels, ahead of Morocco, the United Arab Emirates, and Iraq. Millennials in other parts of the world are promiscuous in their brand loyalty, which is a growing concern for marketers. 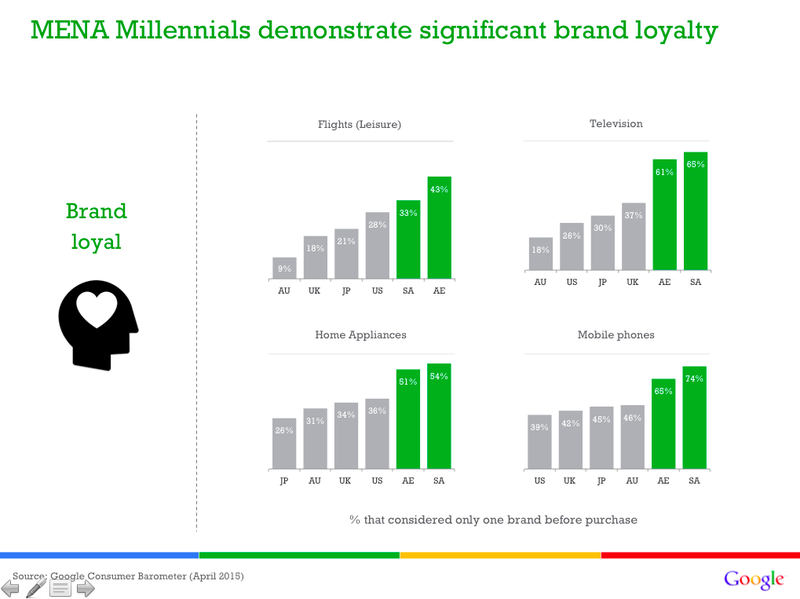 However, according to the Google Consumer Barometer , millennials in the Middle East demonstrate more brand loyalty than their peers in the US, the UK, Japan or Australia. Saudi Arabia and the UAE show a significantly higher percentage of millennials who consider just one brand when they buy. Whether in the MENA region or elsewhere, millennials do their homework before committing to a brand. Being one of the regions with highest levels of mobile phone use makes MENA a unique market: mobile use is almost 100% among millennials in the region. They discover, engage and buy via this medium. If they’re more loyal than their global peers, Arab millennials seem to be less forgiving if they encounter an issue on mobile site: 43% of millennials in Saudi Arabia will look for another site that is mobile optimized if they experience any problems. Brands in or considering the region should strengthen loyalty by increasing personalized interactions. Fom a psychological standpoint, our interactions with brands and offers often arise from our positive experiences of customer engagement. Customization and personal attention lead to a feeling of being understood by brands, which can increase adoption among millennials. INSEAD recently surveyed 16,000 18-30-year-olds across the world. One of their key findings was that millennials in the region think differently about the relative power of institutions versus individuals to influence society. Forty-two percent said the private sector has the strongest influence, while 27% chose the government. Individuals alone were seen as having less ability to influence society. When it comes to influencing an organization , however, only a quarter of millennials in the Middle East chose it as a goal, in comparison to nearly half in Europe and North America. Since most millennials will have to be managed at some point in their careers, it’s important for organizations to understand their perception of the perfect manager, and support their growth as leaders accordingly. In North America and Europe, millennials value being empowered by their manager, meaning they have more personal freedom and are trusted to make decisions. Western millennials also try and avoid micromanagement. Middle Eastern millennials feel less strongly about this and expect their managers to have all the answers. As for leadership, millennials around the world aspire to be given such positions. However, the importance of titles varies greatly around the world. Although unimportant in Central and Eastern Europe and irrelevant in North America and Western Europe, titles are important to millennials in the Middle East and to their Latin American, African and Asian peers. A manager in the Middle East will only be successful if he or she leads by example to inspire employees, setting transparent performance criteria and giving fair evaluations. Millennials in the region are generally less interested in traditional forms of democracy, showing no interest in political parties. Many have referred to the aftermath of the Arab Spring as being rather cold, considering the setbacks countries like Libya, Tunisia or Egypt have experienced in terms of achieving democracy, stability and human rights. Five years after the Arab Spring began, only 36% of young people in the Arab world believe that the situation in Arab countries has improved - a drop from 72% in 2012. The only country which feels differently is Egypt. According to the 2016 ASDA'A Burson-Marsteller Arab Youth Survey , 53% of millennials in the region believe it’s more important to have stability than democracy and 67% think that Arab leaders must work harder to improve citizens’ human and privacy rights in Arab countries, as well as women’s rights. There is almost no difference in the percentage of men and the percentage of women who support more women's rights. Millennials in the Middle East are generally less religious than generations that have preceded them, with 52% stating that they believe religion plays too central a role in the Middle East. What’s interesting about millennials in the Middle East is that they’re forming political and social organizations based on the basis of being young, thereby representing the interests and goals of their generation. Many of the millennial activists that shaped the Arab Spring are now putting their energy into NGOs rather than political parties. Understanding, attracting and retaining talent in the region goes hand in hand with creating a pool of local leaders for the future. Arab millennials will elevate the region to new levels of dynamism. Highly educated, cultural chameleons and hard-working, in a few decades the region will hopefully reap the benefits of what this generation has seeded. The Arab Spring might have been a disappointing event for many, but a different kind of revolution is happening. Millennials around the region are using notions of personal rights, freedom and enterprise to challenge the authoritarianism, poverty and stagnation that had afflicted their societies.